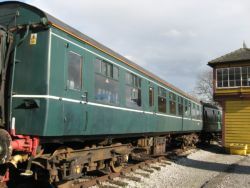 59791 is the sole surviving Class 107 trailer car in existence. It was purchased from the Batterfield line at Shackerstone, where it had been in use as hauled coaching stock. Whilst here the high vacuum pipe work was converted to be a through pipe for steam heating. Class 107 Ltd. started refurbishment work on the trailer car at Doncaster in the summer of 2000. Work involved reinstating the high vacuum pipe, in addition to replacing much of the air pipe work which had badly deteriorated. The vehicle has been externally repainted into Brunswick green. New lino has been laid and seating reinstated, as well as a rotten window frame being replaced. One end of the trailer has been left without seats fitted so that a bar can be fitted at some point in the future. This would hopefully enhance the prospects of hiring out a DMU set for special occasions. After some time spent at Bolton Abbey the trailer car was used on the Wensleydale Railway before returning to Bolton Abbey. The vehicle is now located on the Nene Valley Railway.